In a large bowl, whisk together the sprouted spelt flour, coconut palm sugar, cocoa powder, baking soda, and sea salt. Make a hole in the middle of the dry ingredients and pour in the sunflower oil, apple cider vinegar, vanilla, coffee, and water. Stir the batter with a spatula until smooth and fully combined. Divide batter evenly among the cupcake tins. Bake for 20 minutes, or until cakes spring back when lightly touched or a toothpick inserted into the centre of a cake emerges clean. Cool cupcakes completely. Place coconut cream in a bowl and whisk. Add the maple syrup and vanilla powder. Whisk on high until you have an airy and smooth cream. 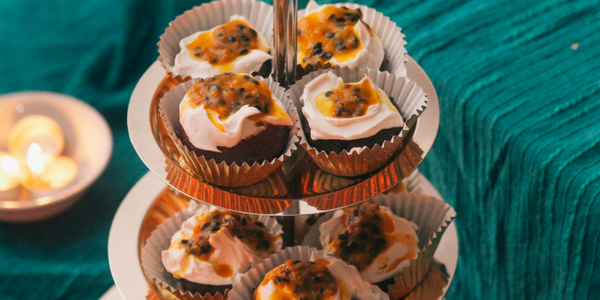 Divide coconut cream icing among the 12 cooled cupcakes, smoothing it out and leaving little pockets at the top for the passion fruit. 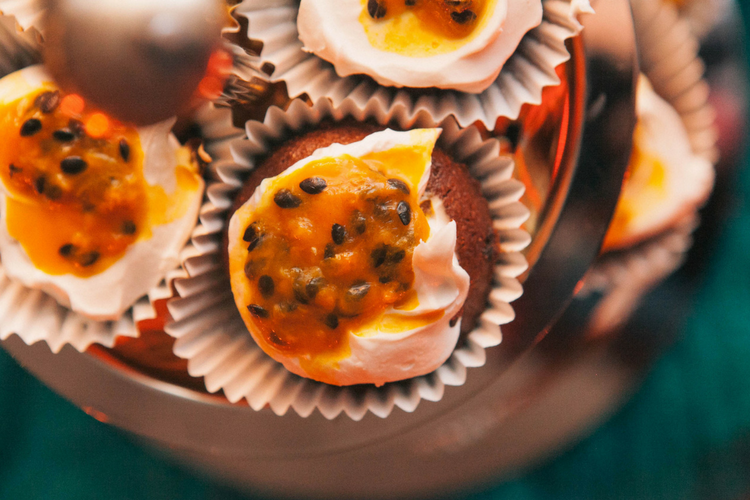 Cut passion fruits in half and scoop out about one teaspoon of pulp per cupcake. Serve immediately. Delicious! If you like this recipe, why not try our 15 minute cup brownies recipe?